Rascal Flatts is an American band that originated in Columbus, Ohio. 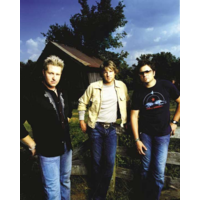 Since its inception, Rascal Flatts has been composed of three members: Gary LeVox (lead vocals) and Jay DeMarcus (bass guitar, keyboard, piano, vocals), and Joe Don Rooney (lead guitar, vocals). LeVox and DeMarcus are second cousins. Between 2000 and 2010, Rascal Flatts recorded for Disney Music Group's Lyric Street Records. While on that label, Rascal Flatts released seven albums, all of which have been certified platinum or higher by the Recording Industry Association of America (RIAA). In order of release, these albums are Rascal Flatts (2000), Melt (2002), Feels Like Today (2004), Me and My Gang (2006), Still Feels Good (2007), Greatest Hits Volume 1 (2008) and Unstoppable (2009). After Lyric Street closed in 2010, Rascal Flatts moved to the independent Big Machine Records, releasing Nothing Like This in November 2010. Rascal Flatts' studio albums have accounted for twenty-six single releases. All of these have charted within the top 20 or higher on the Billboard Hot Country Songs charts; all but one has made the top ten, and eleven have made number one. The band's longest-lasting number one, a cover of Marcus Hummon's "Bless the Broken Road", spent five weeks in that position in early 2005. The late 2005–early 2006 release "What Hurts the Most" was a number-one on both the country and adult contemporary charts, and peaked at number six on the Billboard Hot 100.